Aquaman #19 has much to admire. Perhaps too much. Involved stories with expansive casts are the bread and butter of Geoff Johns but I can't help but think he's biting off more than he can chew with his latest epic. 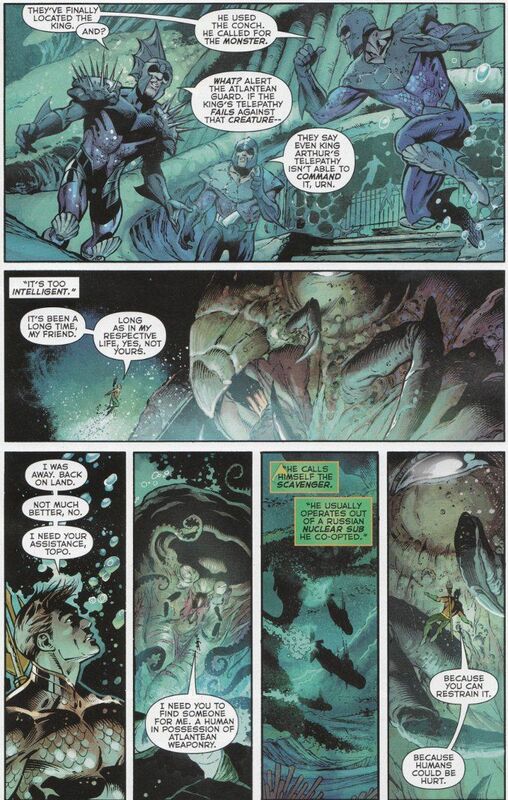 The current storyline was complicated enough in the wake of Throne of Atlantis with Aquaman struggling to maintain a fragile peace with the surface world after he became King of Atlantis. Last month's issue introduced further complications, with a military coup made up of soldiers still loyal to the former king pending and Mera facing legal prosecution at the hands of a vindictive sheriff. This issue introduces even more complications, with the introduction of Mera's never-before-seen first husband and a new figure claiming to be the king of Atlantis. This is in addition to the development of the other storylines, with the rebellious soldiers attempting to recruit Swatt - the only Atlantean who cannot breathe underwater and - as such - an expert on the surface world, who collects sunken artifacts just like Ariel from The Little Mermaid. 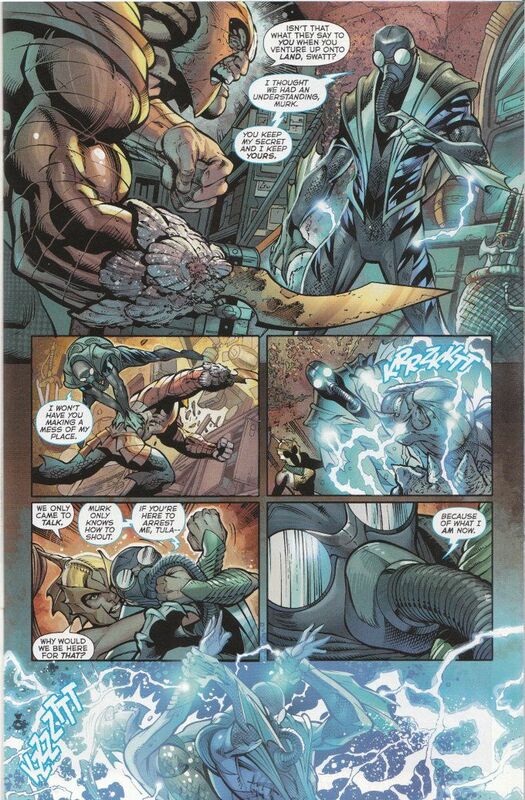 All this and Johns still finds time to reintroduce Aquman's octopus pal Topo into the New 52 continuity. This is all well-written but it's all a bit much to be going on at once and there's no clear payoff in sight for any of these storylines. One thing that is clear is the pencils of Paul Pelletier. His figures are still as open and well-defined, with Sean Parson's inks perfectly defining his work. The artwork of this series mirrors its' scripts in complexity but remains far easier to follow. I'm not certain I'll be staying with Aquaman for much longer. The opening arc was enjoyable enough and the second storyline suggested a rich new history for Aquaman with its' introduction of The Others. Sadly, that history went largely unexplored and while I enjoyed the Throne of Atlantis crossover with Justice League, the series at present seems to be confusing complex storytelling with a mass of subplots. I'll give it until the end of the current arc out of loyalty to the book as it was starting out but that's as far as I'll go.